You will need three ingredients. That’s it! First spray your 9 x 13 pan with Pam. Then pour your berries into the pan. Spread the berries out so that they are all evenly dispersed. Add dry cake mix over the top. The recipe calls for a white cake mix, but all I had was french vanilla. DO NOT stir the cake mix and the pop – this will give you a ‘crust’. This is what your cobbler will look like before you put it in the oven. Bake 350 for 45-50 min. This is what it looks like when it is finished. I ate my Berry Cobbler with a 1/2 cup of No Sugar Added Blue Bell Country Vanilla ice cream. It was so good! Place frozen fruit in a 9×13 baking dish. Add dry cake mix over the top. Pour soda slowly over cake mix. 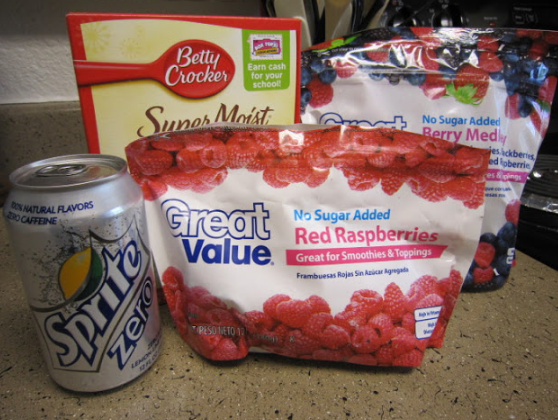 DO NOT stir the cake mix and the soda – this will give you a ‘crust’. If you stir the two, you will have a cake like topping.